Picture sparkling water.....Perrier anyone?........as your guests arrive at your awesome dinner party. Could I interest you in a Scotch and soda, or perhaps a Tom Collins? Until you have to refill Sodastreams' crazy monopolized CO2 bottles. $19.00 for a refill or $39.00 Canadian for a new bottle. Well we came up with our own solution. Their Genesis machine is made of plastic cheapness...but it looks nice enough to sit on the beverage counter. I was afraid it would be knocked over as it seems to be quite top heavy. Our solution (expensive but a rebel against a company monopoly). We looked on-line and found CO2 Doctor. Make sure you buy pressure rated parts. Compressed gasses can be very dangerous. The parts are very pricey but the service was awesome. 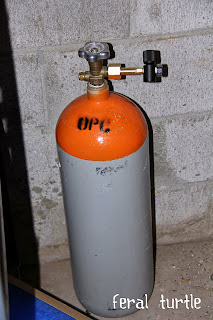 We bought a 20 pound CO2 tank from a local supplier. Because hubby and man child are avid paintballers, we had an abundance of 20 ounce CO2 tanks for paintball guns. We ran a hose from our Sodastream machine, through the counter top, to a paintball canister. We cut a corner out of the shelf. The CO2 container has to be upright and not on its side. This was an easy fix. A new hole was drilled for the shelf support too. We had to modify our cupboard and drill 2 holes into our concrete counter top. OOOHHH I smell another blog idea coming. Anyways, as this wasn't one of our best counter tops that we created, we felt it was OK to do a little digging. Yikes. The first hole is for the hose. This hole goes right through the counter top to the cupboard below. The second hole was for a bolt. It is only drilled halfway through the counter top. The bolt was epoxied in, and a hole drilled through the base of the Sodastream drip tray. A Dremel tool was used to grind away the ribs to make room for the nut. I hardly lost any cupboard space. Now it sits firmly on the counter top with little fear of cheap plastic shards all over the floor. I can remove it with a socket if I have to, WHAT....CLEAN???? Nah....That's not dumb at all. Its a machine that carbonates water. You can buy flavorings to make your own pop or just use it for sparkling water. You could probably google it and find out more. There are different brands of carbonation systems too. Probably better ones. lol....Cheers! Hi again Karen, it would seem your button is not working. pls. check my recent post. Super jealous of the beverage center... I want! And super duper in luv with your blog, Frugal, Fun and Functional. You're hacking your sodastream, have a mazzer mini grinder and yet you have not put a PID in your Silvia? You need to get on that, they now have PID kits that pre-infuse -- though opening the steam wand before you pull a shot works too. I have an Auber kit and love it. So co2 gas from dicks sporting goods will not get you sick then or taste funny?